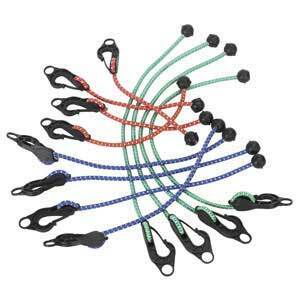 Adjustable composite hooks with ball-ended bungee cords. 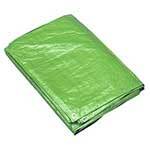 This is an easy to use set of colour coded tarpaulin cords for the safe lifting of a variety of items weighing up to 20kg. The bright, light weight and strong set of cords consists of adjustable composite hooks with ball ended bungee cords. They are extremely light weight, weighing just 0.7kg, without compromising on the strength each one can handle. This Sealey Tarpaulin Cord Set of 12 cords is supplied colour coded so it is easy for the user to select the best length appropriate for each job. The cords are supplied in sets of four in three different lengths and are simple and easy to use. The cords themselves are durable and hardwearing, being made of strong tarpaulin. To operate, detach the cord from its hook, feed it through the black eye of the tarpaulin rope and then reattach it at the required length for each job. This straightforward process means the cords can be used for a wide variety of jobs involving different weight loads. The cords are colour coded red, blue and green in increasing length: there are four cords measuring 310mm in length with a maximum stretch of 550mm, four 440mm cords with a total stretch of 800mm and four of 600mm with a large maximum stretch of 1050mm.